Central Queensland Soil Health Systems > Soils & Nutrients > Why Carbon Flows? Did you know that cattle are 18% carbon? This article is going to take a more expansive look at carbon to the way it is currently treated in extension. When producers sell cattle, they are selling a carbon compound. The reason the term carbon compound is used, is because carbon is the main building block of all life on this planet, including cattle. Carbon is one of the most successful atoms at bonding with other atoms. In fact, all rural production sells something that has lived, be it meat, fibre, grain, hay or vegetables. The best way to understand what life includes is to think of what dies. Grass dies, cows die, soil microbes die, crops die and worms die. Not only is carbon the main building block of all life, but it is also responsible for carrying the energy that all life relies on, as it flows through the paddock above and below ground. Nutrients and water also follow the path carbon takes. Put simply, the natural world can’t function without “flowing carbon”. Producers are managing more than just the carbon based products they sell. They also have to ensure their management supports the other carbon based life that maintains the productive capacity and health of their production systems. Soil life that is responsible for keeping the soil well-structured and fertile, will not exist if carbon does not keep flowing through the soil to allow them to construct their little bodies. In a grazing system, grass that is 45% carbon when dried, supplies the carbon that cattle require to construct themselves. Current extension has a focus on carbon stocks and measurement whereas this column will focus on the management of carbon flows because this is the most fundamental of the basics a producer has to get right. Get the basics wrong and nothing else will fall into place the way they should. There is a reason why current extension is focused on carbon stocks and measurement. The focus of climate change policy is on carbon stocks and measurement. Hence this is where funding is directed, including extension. Carbon stocks are a snap shot of how much carbon is in a paddock at one point in time, noting that not all the carbon present is measured. But, it is thinking carbon flows that allows us to better understand how a paddock, and everything in it functions and needs to be managed. Follow the path of carbon and what happens in a paddock will be a lot clearer. A producer’s day job is recycling carbon i.e. managing carbon flows. They set out to turn a portion of the carbon that is flowing through the paddock into saleable carbon products, like meat and grain. The more carbon that flows, the more cattle and grain are produced for sale. Carbon is always moving (sometimes quickly and sometimes slowly). Carbon moves from one life form to another via consumption. 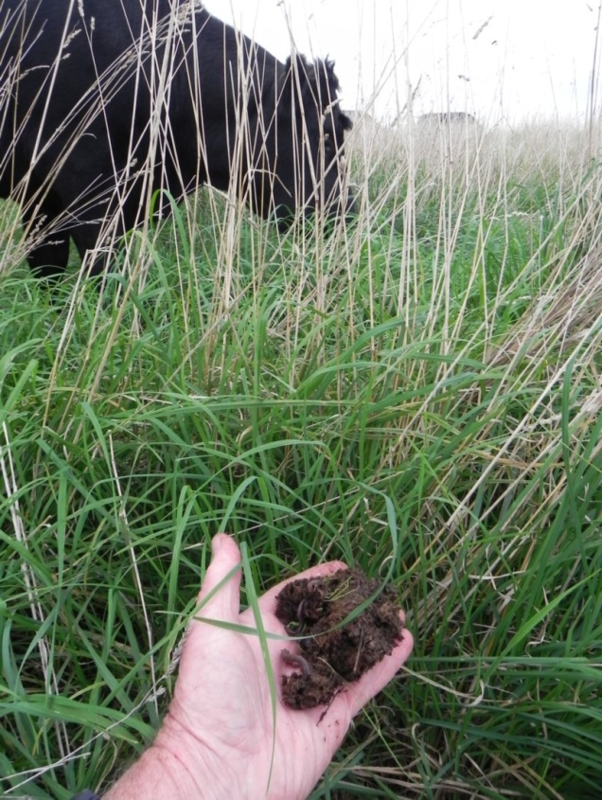 Above ground, when cattle eat grass, the carbon in grass moves into them. Selling cattle is harvesting carbon when it has entered the cattle part of the food chain. Then the carbon moves into us when we eat meat. Carbon also moves into us when we eat vegetables. It just happens that humans are also 18% carbon. When we breathe out carbon dioxide, this is simply some of the carbon that has entered our bodies (via food) moving on. In this case, the carbon is flowing back to the atmosphere. Below ground, carbon also keeps moving to maintain soil life. Without the ongoing flow of carbon and all the compounds it forms, as it keeps moving, the landscape would become bare and lifeless. Plants rely on carbon inflows to construct themselves. It is plants that make carbon available to the food chains that underpin commercial production and positive environmental outcomes. How successfully pastures are able to introduce carbon into the landscape in the first phase of carbon flows is determined by animal management. Plants and animals have evolved together and rely on each other. However, if animals dominate plants, then carbon flows are reduced. In the absence of animals, pastures become moribund and again have a lower capacity to introduce carbon into the paddock. For those interested in long-term soil carbon, this carbon has to start the journey as short-term carbon in the first phase of carbon flows. Everything discussed to this point makes management of carbon flows the cornerstone of food production, rural profit, reducing the effect of dry times, improved water quality and meeting the expectations of the broader community for better environmental outcomes. Carbon is the main building block of cattle, grass and soil life and carries the energy that all three require.